DOHA, Dec 7 - Japan sounded a warning to China ahead of the Beijing Olympics by matching the swimming giants' gold medal tally at the 15th Asian Games, while a South Korean teenager became the fastest Asian ever over 1,500m on Thursday. While 17-year-old Korean Park Tae-hwan celebrated his third gold of the Games after breaking the 15-minute barrier in the 1500m freestyle, Japan clinched three golds to under-pressure China's one, leaving them tied at 16 titles apiece. China took home 21 swimming golds to Japan's 10 at the last Asian Games in Pusan. At the end of the final day's racing at the Hamad Aquatic Centre, Japan finished with 47 medals compared to China's 44. The overall results will be a huge disappointment for China ahead of the 2008 Olympics. 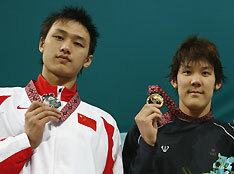 But Zhang Lin, who lost his Asian 1500m freestyle record to Park, said the Games had not been a disaster. "The whole of the Chinese swimming team are satisfied," he said. "We have tried many new young swimmers on this team." Japan's Kosuke Kitajima celebrated his return from injury with his second gold medal of the competition, successfully defending his 200m breaststroke title. The double Olympic champion turned first at every wall to finish in a time of 2:12.05. Japan took the first gold medal of the night in a tight men's 50m backstroke final, with Junya Koga (25.40) getting the touch over Asian record holder Ouyang Kunpeng of China (25.47). Japan's third title came when the men's medley relay quartet outclassed the Chinese team, finishing just shy of the Asian record in 3:36.52. Qi Hui kept the Chinese flag flying by completing a hat-trick of gold medals with a convincing win in the women's 200m individual medley. The world short course champion clocked 2:11.92, the third fastest in the world this year, to add to her 200m breaststroke and 400m Individual medley titles. Qi put her impressive performance in Doha down to experience, and said she would decide early next year whether to focus on the breaststroke or individual medley ahead of Beijing.